I am hearing stories that many old-time settlers on Gozo are in process of upping sticks and returning to the mother country or elsewhere. By “many” I mean more than a dozen, for example, from Għarb alone. But they are leaving the other villages, too. It is of course highly likely that there are yet more that I haven’t heard about. While this news may bring some glee to the few (but vociferous) “anti-colonialists”, I should point out that the Leavers - for want of a better word - are not all Brits. There are Germans, Danes, Irish and South Africans among them, and probably other nationalities. They are (they appear to be) mostly long-term residents. Some, looking only for a warmer climate, had tried places like Spain or Cyprus first. Some had been here in the forces, or as children of service families and maybe even been educated here (in the old days). Some – a much smaller number – had married local nationals. Others had come on holiday and decided that Gozo was the place they wanted to retire to. They had all fallen in love with it. They bought property here, and generally improved it. They became, in effect, locals. And the Gozitans, for the most part, welcomed them, openly flattered that, in competition against all the other options, these people had - rightly - chosen Gozo. It was bare, and beautiful. It was virtually empty. There was a small handful of acceptable restaurants and a couple of decent bars. There was nothing to do, except walk, maybe cycle, read, write, paint... enjoy the scenery and the colourful weekend fiestas, while the natives mostly fished and farmed. In those days electricity, although not exactly reliable, was cheap, as were telephone calls. The post office effected same-day delivery of mail. The guy on Directory Enquiries seemed to know all the phone numbers by heart, and knew everybody’s nickname. Eating out, which meant “local” — not “European”, not “Mediterranean” or “fusion” — was appropriately priced. Second, the people on the other island realised that discerning tourists greatly preferred Gozo, so went there for a look and quickly realised (their conclusion) that it was “cleaner, greener, and quieter” than the disintegrating place they lived in, and started to holiday there themselves. They, too, bought houses, and realised how much more pleasant it was to shift there every weekend and public holiday and for their long annual vacations, than to stay at home where everything was filthy, overbuilt, and noisy. They also bought extra land (still cheap, at first) and started building - much of which remains unfinished. The four-storey limit and the no-buildings-on-the-coastline edict were quickly forgotten, because it was the Maltese who wanted to break the rules. Gozitans didn’t lock their cars and used to leave their keys outside in the door, “except at weekends and in August, when the Maltese come over”. In fairness, I have heard of only one car theft on the island - by two Maltese who were stopped by police before they reached the ferry. But most Gozitans know about the Maltese who came over on Saturday nights and stole from the homes of elderly people who were attending early Mass on Sundays. Goods in the shops had been unlabelled in the old days, because shopkeepers had different prices for locals (including foreign residents), for tourists, and for “the Maltese” - in ascending order. Then they, like the taxi drivers who asked €50 for a ride from the ferry to Victoria, because visitors didn’t know what the distance was, quickly learnt The Maltese Way: Rip them off while they are here because they are not coming back (and they won’t be coming back because they got ripped off). The “mainlanders”, as they consider themselves, now claim that they keep the island economy afloat by coming all year round. But all they do is keep the third-rate places going, at the expense of the first-rate: the many, at a cost to the few. Like for like, it is now cheaper to eat in London or Paris. Otherwise it would be the few locals and the few ex-pats who supported the few, deserving restaurants through the winter months. Weekenders also like fast food and grub from vans that have parked up and declared themselves to be “kiosks”, like they are used to back home. They have filled the island to overflowing, parking anywhere, often in a manner that would elsewhere be described as “stopped in traffic”. And then they cry like children that they have been “picked on” if they get a ticket. The locals (native and foreign) can’t even get into Xlendi or Marsalforn, formerly quiet seafront retreats where roads and pavements have been first “embellished”, and then given over to tables and chairs. They can’t do the traditional passiġġata, the walk, in their finest clothes. along the Mġarr Bay track, on Sunday evenings because they can’t get there through the streams of traffic queuing for the ferry. Lots - I would guess that by now it is hundreds of them - have lost, through new building, the sea or country view from the homes they bought. Some can’t bear the constant noise of builders or that the weekenders create. Some complain about the amount of litter they have to pick their way through in the streets, especially on Mondays. Some fear that the creation - or even the suggestion - of a tunnel will spell the death knell for their island. I can fully understand that some elderly people want to go “home” in order to watch their grandchildren grow up. 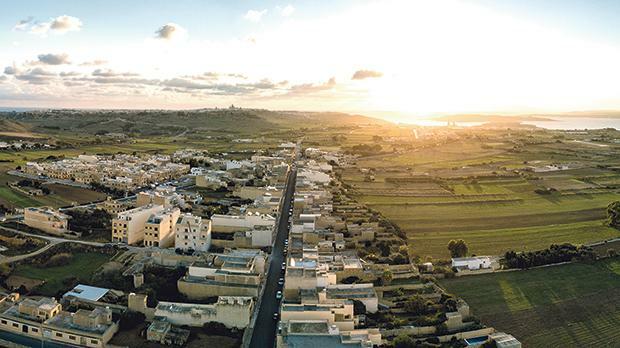 I know that some - despite the fact that much (by no means all, and there is a tendency to exaggerate it) about Gozo’s medical care is generally excellent - want a more accessible health system for specialist treatment. But that does not explain why some of them have been considering relocating to the Azores, or the Canary Islands, or Croatia. When I travel to the UK I say I am going “back, for a visit”. When I return to Gozo I am coming “home”. A former Fleet Street reporter and editor, Revel Barker is now an author, book-editor, and publisher.